“Jamaican Children” is a 30″ x 40″ oil on canvas painted in 2010. 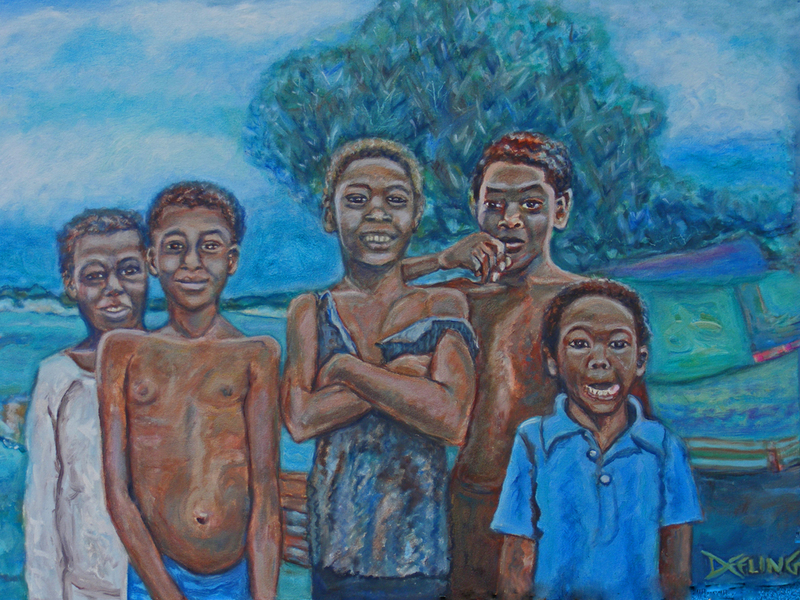 I recently decided to do a painting from a drawing I did from a photograph of five Jamaican children in Montego Bay. Their expressions were joyous, pensive, playful. The preparatory drawing became a favorite of mine and I couldn’t bear to paint over it. I really wasn’t up to doing another preparatory drawing. Somehow, living in a small town in Montana, the time seemed right to tackle the project again. I feel comfortable enough to paint freely without a preparatory drawing. Maybe I can show it in downtown Great Falls, which in itself will be worth the effort. And if you’re wondering what became of my previous work in progress, “Sienna Moon,” it was snatched off my easel and is presently on display in downtown Great Falls. I never got a chance to finish it. We hung thirty paintings for the downtown Art Walk, an effort to draw people to the deserted downtown area, which has become a bit of a ghost town. Perhaps “Jamaican Children” will liven things up a bit!